Dining with a veggie and one (not too strict) vegan we opted for non-meat options throughout, starting with a beautifully colourful bruschetta with sweet cherry and yellow datterini tomatoes. 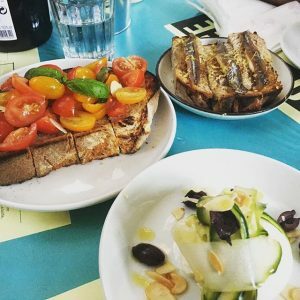 We also went for the toasted house-made bread and butter with Amalfi coast anchovies, and finally Burrata with pickled courgette, black olive and almond. This list of deliciousness was of course just a warm up to the main event so it was lucky we had arrived hungry. 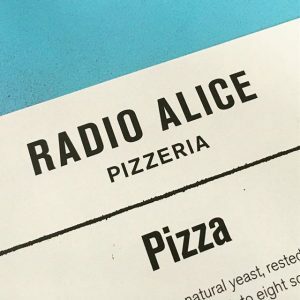 In May and June Radio Alice had a new guest pizza on the menu every week and we coincided with Carousel‘s offering of a grilled leek cream, garlic puree, pickled anchovies, spring herbs and flower pizzas. I can’t say it makes it immediately onto the favourite list but it was really fun to experience the chef’s creativity with some alternative and interesting ingredients. More memorable for me was the gorgonzola, fiordilatte mozzarella, honey and walnut pizza with the speck excluded. 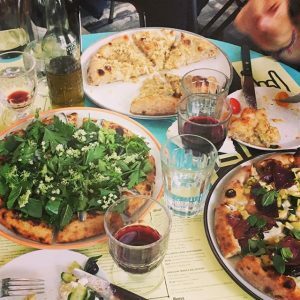 Without the umami of the meat, the pizza became fantastically imbalanced and tasted to me like hot buttery granary toast lathered with gorgeous honey and memories of growing up in rural England. 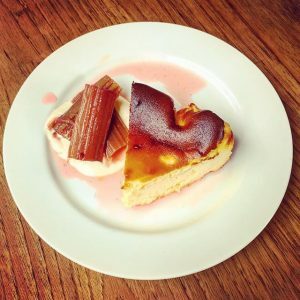 My guests weren’t convinced with the overly sweet main but I seriously loved it and would definitely eat it again, possibly with a nice cup of tea! After this we were pretty full but wanting to do a proper job of testing out the full menu so we found room to share cannoli, ice-cream and tiramisu, plus coffee and limoncello! The staff were so lovely, they even let this nosy foodie pop behind the counter of the open kitchen and try my hand at making my own pizza in their traditional stone pizza oven. A really lovely night and I’d definitely go back. 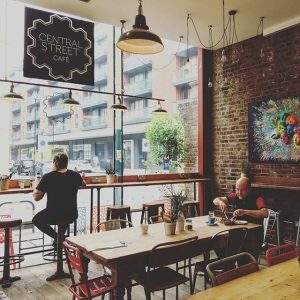 Now I’m not sure when Central Street Cafe opened as it’s a little off my old regularly beaten track. Only a 10 min walk from Old Street it avoids the hoards of hustles, the deluge of developers and the engorgement of entrepreneurs, buzzing round Old Street like flies on a long-dead silicon unicorn. But enough about my disenchantment of Old Street… this place is absolutely great and definitely worth the detour. 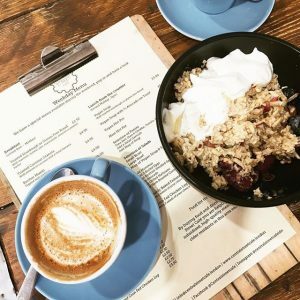 As a community builder myself I highly approve and couldn’t wait to check it out, so I suggest to a client we meet there for breakfast. Immedately they ticked all the boxes for a digital nomad… good food, good coffee and most importantly good wifi! Tap water available to help yourself to and generally a really cool vibe, I definitely recommend a visit and, I will be back. 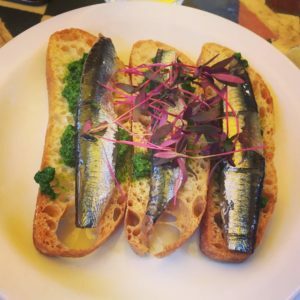 Another place that I know for sure isn’t new is Brindisa, an old date night haunt of mine serving Spanish food with a focus on tapas. I’d heard that they had a gin and Paella event happening on their terrace but unfortunatley I was a few days too early. No harm done, I met up with and old school friend and enjoyed a few hours catching up with all her news as we tucked into tapas and sangria. Now when a lawyer reaches out and says he wants to treat you to lunch so you can discuss a potential partnership for his firm, there is really only one thing you can do. Send him a list of all the new places you want to try but for which you can’t quite justify the expense, and hope he’s going to be good company. Well did this guy come up trumps or what! First off he chose Brat, which I’d heard from a lot of people was a place not to miss. Secondly he said he was happy with sharing plates, as his wife is a total foodie and he knows the rule “photo before feeding” (haha) and finally, he was very generous and wonderful company. We did the menu proud. Brat is a very grown up restaurant fitting in with it’s immediate Redchurch Street neighbours Andina, Albion and Dishoom. The menu is a simple one pager and leaves the detailed story telling of the food to your very attentive waiter or waitress. The staff are dressed in understated but very Soho House style trendy dark denim and every single one of them came across as exceptionally experienced and welcoming. On a weekday lunch time there were a bunch of city slickers dining and I observed that most of them were drinking either a cocktail or wine. Ah London I have a love hate-relationship with your attitude to booze… on this occasion it was love and I accepted a full bodied glass of red. This time I was not dining with vegetarians and so had the freedom to try a broad range of dishes. First off was the Wild Rabbit, Blood Sausage and Beans which although slightly shy on blood sausage, especially for a sharing dish, was gorgeous. 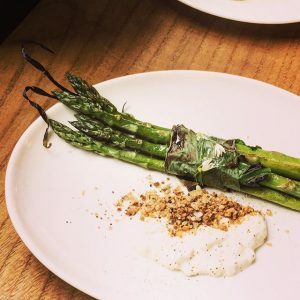 The asparagus, whilst nearing the end of the season, was stylishly served with fresh cheese, delicate and full of flavour. 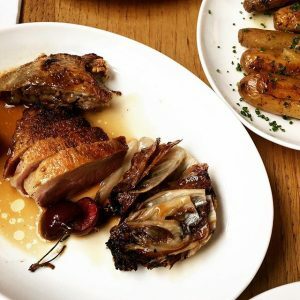 We ordered a side of Smoked Potatoes with the The Roast Duck and still had a little room left for the Burnt Cheesecake. 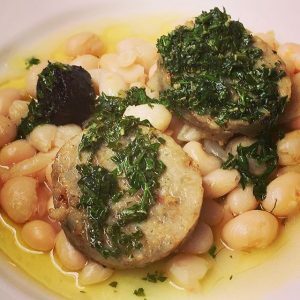 There is absolutely nothing brattish about this restaurant, the food, the service or the sense of satisfaction and sophistication I was left with; I was one very happy foodie. If you liked this post please head on over to Instagram where I post all about food and restaurants as @thetaleofateaspoon.